I'm happy to share my most recent creation. 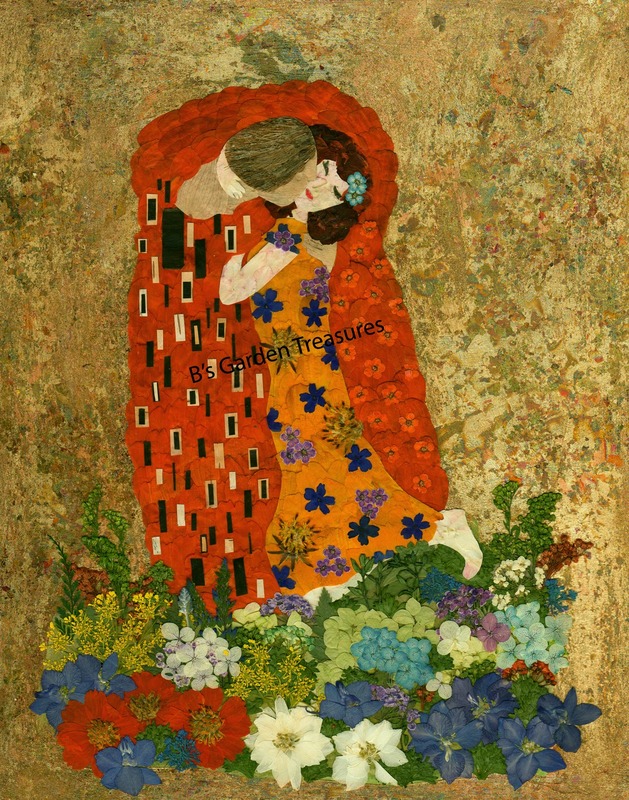 It features my pressed flower and gilded background rendition of “The Kiss” by Austrian Symbolist painter, Gustav Klimt (1862-1918). It depicts a couple embracing, their bodies entwined in elaborate robes decorated in a style influenced by both the Art Nouveau style and the earlier Arts and Crafts movement. Klimt combined oil paint with applied layers of golf leaf, referred to as gold leafing or gilding. In my rendition, the woman was created using pink and white larkspur for her skin and marigolds for her hair. Her robe features yellow cosmos petals adorned with verbena, bridal wreath and the cosmos flower centers. For the man, I used aged dogwood flowers for his skin and browned lily of the valley leaves for his hair. His vibrant robe features orange cosmos petals adorned with bridal wreath, birch bark and banana skin. Other botanicals include larkspur, queen anne’s lace, cosmos, hydrangea, bridal wreath, solidigo, thyme, parsley and fern.